Program for the dedication of the Flentrop Organ, September, 1965, with Flentrop’s autograph. Last Sunday night after the Compline Service, a young organist gave a solo recital on the “mighty Flentrop”, the big pipe organ at St. Mark’s Cathedral, Seattle. It’s not too unusual to have a guest organist, but an unusual thing happened at the end that inspired me to write about organ music this week. 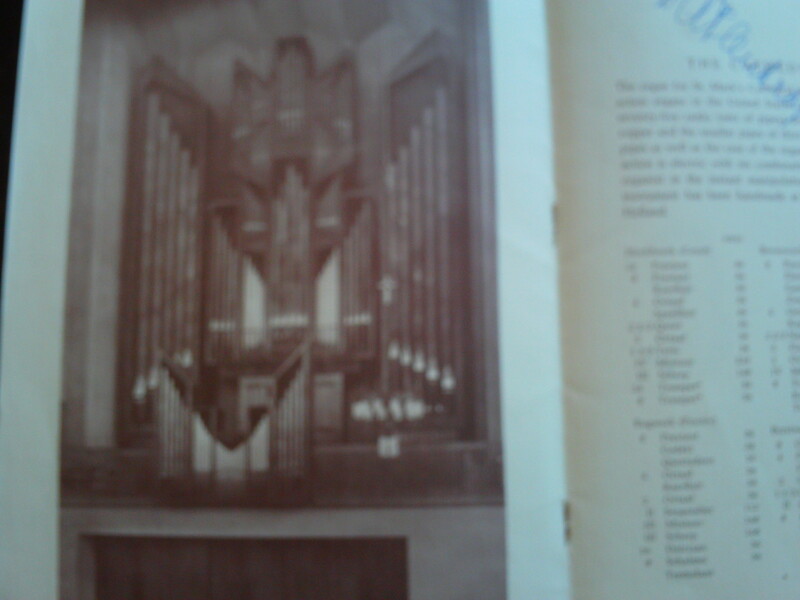 Informal organ recitals have taken place immediately after Compline since 1965, when the organ, built by D. A. Flentrop in Zaandam, Holland, was installed. The Flentrop was one of the first neo-Baroque or mechanical-action instruments installed in Seattle, and one of the largest of its kind in North America. It made St. Mark’s almost immediately a mecca, a pilgrimage destination, for every organist in the country. Peter Hallock, organist and choirmaster at St. Mark’s from 1951-1991, and founder/director of the Compline Choir, made the organ loft available to anyone who wanted to play after Compline. A crowd of us would climb the stairs and listen while Bill Giddings, a member of the Compline Choir, would either play the organ himself or facilitate the playing of others. I’m sure that this after-Compline event brought more people to the service itself, leading to the growth of attendees by 1967 to between 400-600 people, mostly teenagers and young adults. Bill, now a retired chemistry professor, still takes his place at the organ most Sunday nights, and many people hike up the stairs to get a closer look and listen to the magnificent instrument. To give you an idea of what it’s like up in the loft, here’s a video of St. Mark’s organist Mel Butler giving an organ demo after church. Last Sunday was the night before Presidents’ Day, and we had an extra-heavy attendance of young people at Compline. The organist, Kyle Kirschenman, was himself only a junior in high school [update 2012: now beginning organ performance studies at the University of Washington in Seattle]. He reminded me of so many young organists, who over the years have made their pilgrimage to the Flentrop. One of those prominent in the organ “free-for-alls” back in the late 1960s was the then 16-year-old Roger Sherman, who now heads Gothic Records, a national source of organ and choral music. In 1993 he started the radio program The Organ Loft, which in Seattle follows the Compline Service on Classic KING-FM; The Organ Loft has both organ and choral music, and it’s the next best thing (and in some ways better!) to being at St. Mark’s in person after Compline. Another young person I remember was Bruce Neswick, who sang with the Compline Choir while in college, and is now the organist at the Cathedral of St. John the Divine in New York City [update 2012: he’s now associate professor of music (organ) at Indiana University] . I have always sensed intuitively a link between music and spirituality, but could never until recently articulate the similarity between a concert and a worship experience. I have come, mainly through being a Benedictine oblate, to see that deep listening is the same as meditation, and that the process of focusing one’s attention on music in either performance or listening is no different than a Zen monk focusing on the qualities of a moss-covered rock. Many of the young people that come to Compline refer to it as a “concert”, and I don’t have a problem with that. 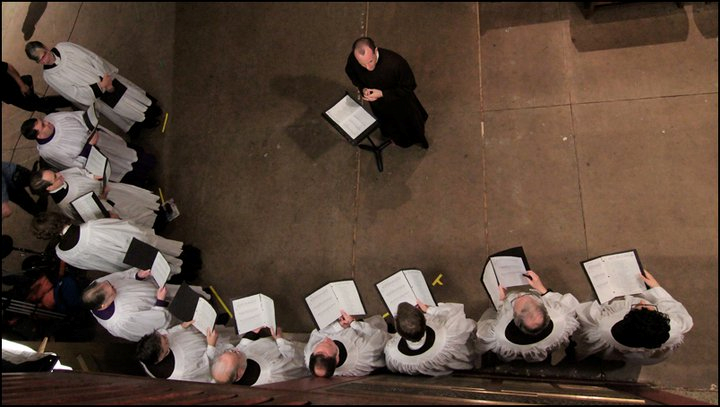 The divine office is a concert for deep listening — and afterward, organ music provides additional opportunities for mindfulness. Taking a larger view of musical beauty, all forms of creation, whether they be meant for deep reflection, or simply for enjoyment, have that divine creative spark. Spirituality has been defined as “a stance toward life [where] more and more everything cries out ‘God’ for us” (John Gorsuch, An Invitation to the Spiritual Journey, 1990). Spirituality allows us to process the experience of sound as communion with the Divine, through our own individual discrimination-process (called “taste”), which takes in the qualities of the particular work, the intent of the performance, memories of past hearings, and the special circumstances of the moment. The qualities of a piece of music can vary from those requiring deep listening to those that are simply entertaining, full of playfulness and joy. We experienced both kinds of beauty with Kyle’s recital last Sunday. After his program, which included an arrangement of Barber’s “Adagio for Strings“, the people gave him a round of applause. He then launched into an arrangement of “Be Our Guest”, from the 1991 Disney movie “Beauty and the Beast”. Many of the young people in the audience knew the lyrics, and sang along — I even saw several young women dancing on the labyrinth in one corner in sheer abandon. I smiled with recognition, at my own youthful excitement during the organ “free-for-alls” of the ’60s. But I believe that this spontaneous sing-along was a first for these after-Compline concerts! Psalm 134 is the next-shortest psalm in the Bible – Psalm 117 has about half as many words. Although the portion “you that stand by night in the house of the Lord” evokes the priestly class worshipping in the temple, Robert Alter, in his translation of The Book of Psalms (2007), comments (p. 464) that “the acts of the sacrificial cult were completed by sundown, but the reference here could be either to the tending of the fires and the temple lamps through the night or to those who stayed to pray, or perhaps to partake of the sacrificial feast, through the hours of the night”. It seems like an excellent way to describe all who pray before retiring for the night. 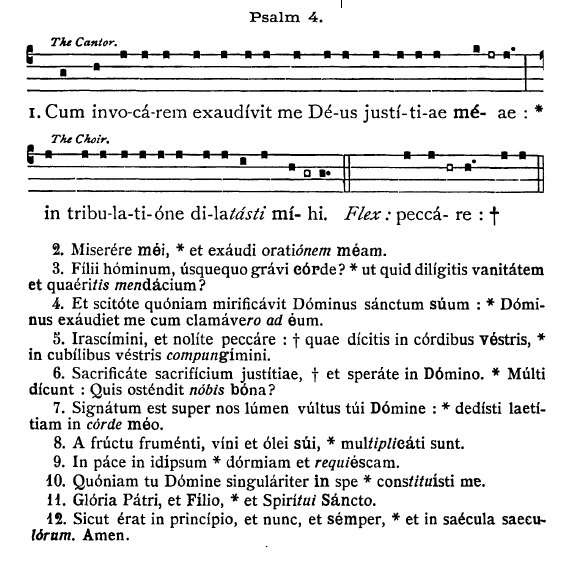 Alter translates the psalm as three verses, beginning the third where the BCP has a semicolon. His second verse begins “Lift up your hands toward the holy place and bless the Lord”, implying that the Hebrew qodesh (“holiness”) can not only designate the sanctuary, but might be “an epithet for the heavens”. The psalm is wonderfully recripocal — we take the time at night to bless the Lord, and the Lord will bless us. The fact that this psalm comes at the end of a cycle of fifteen “psalms of ascent” along with the night imagery makes it a natural end-of-the-day prayer. I find it interesting that although Psalm 4:7 only mentions grain and wine (Alter translation: “You put joy in my heart, from the time their grain and their drink did abound”), the writers of the Latin Vulgate (or perhaps the Greek Septuagint from which it was translated) must have had the passage from Deuteronomy in mind when they formed the more poetic “more than when grain and wine and oil increase” (see the Latin in vs. 8 of the chant pictured). I lie down in peace; at once I fall asleep; for only you, LORD, make me dwell in safety. On February 2 was the feast of The Presentation of the Lord – it has a special meaning for Compline, so I will focus my thoughts on it this week. The story of Simeon and Anna has two strong ideas which are central to the Office of Compline; the first is the message of Jesus as a light to enlighten the nations. Simeon echoes Isaiah 49:6: “I will give you as a light to the nations, that my salvation may reach to the end of the earth.” The whole “Song of Simeon”, whose Latin beginning was Nunc dimittis servum tuum in pace, was placed in Compline in the Roman Rite as a Gospel Canticle just before the Preces (prayers), a position comparable to Benedictus at Lauds and the Magnificat at Vespers. During Compline, as the light turns to darkness, we turn to Christ our light. Whenever I sing this canticle I am always reminded of the Presentation, which is also called Candlemas. Before the beginning of the Mass, there is a procession during which the Nunc Dimittis with its antiphon Lumen ad revelationem gentium is sung, and beeswax candles are blessed. It’s another feast of light at a time when winter is at its midpoint; celebrated 40 days after Christmas, on February 2, it is about halfway through the 90 days of winter. To underscore it as a turning-point, the Marian Antiphon sung at the end of Compline changes to a new one, Ave Regina Caelorum. The images of light continue on February 3, St. Blaise’s Day, when in the Catholic church people have their throats blessed by the priest, who holds two crossed candles over their heads or throats. The other deep symbol of the Nunc Dimittis for Compline is that of Simeon now able to die in peace because he has seen the Savior. In Compline, we prepare for sleep, but we also prepare for that greater sleep which is death. 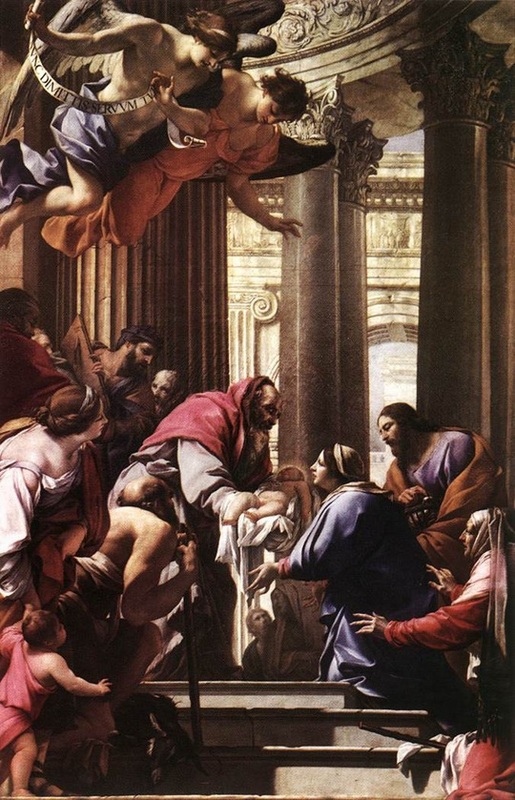 We, like Simeon, are able to let go, and rest in the hope of the Resurrection. I am also moved by Luke’s inclusion of both male and female elders in the story. Not only is Christ’s light and resurrection available to all peoples, there is no distinction in gender or rank (always take note whenever “widows” are mentioned!). I’ve updated this post so you can listen to a setting of the Nunc Dimittis by William Byrd, on the website that accompanies my book, Prayer as Night Falls: Experiencing Compline (2013). Also, a lovely contemporary composition by Johannes Eccard (1553 – 1611) tells the story of the Presentation; you can listen to a recording of it here. May the last verse be our prayer today: Help now thy servants, gracious Lord, That we may ever be As once the faithful Simeon was, Rejoicing but in Thee; And when we must from earth departure take, May gently fall asleep, and with Thee wake.